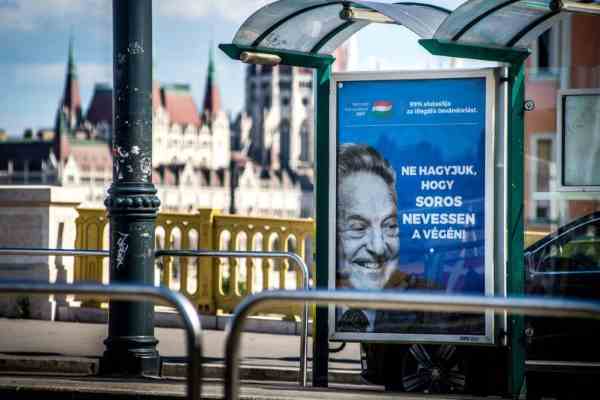 In the political campaign leading up to the 2018 parliamentary elections in Hungary, an unlikely villain emerged on the election posters of the governing party: the Hungarian-American billionaire George Soros. “Let’s not allow Soros to have the last laugh,” screamed the posters, featuring an unflattering black-and-white photograph of the aging philanthropist. While there was little doubt that this was all part of a cynically engineered election campaign, now we know exactly how it came to be, thanks to a piece of investigative journalism published in Das Magazin, a weekly supplement to several Swiss newspapers. A review of their article was also featured on 24.hu, a leading Hungarian news portal. The anti-Soros campaign was the brainchild of George Birnbaum and his mentor, the late Arthur Finkelstein, experts on the technique of negative campaigning. They started working for Viktor Orban in 2008, contributing to his success in the 2010 election campaign. They had an easy task: the then ruling Socialist Party was wildly unpopular and thus easy to target. But after Orban’s second election victory in 2014, the Socialist Party was no longer a useful scapegoat. A new enemy was needed. One obvious target presented itself: International capital, represented by the IMF and the EU, who dictated the conditions accompanying foreign loans that helped Hungary recover from the financial crisis. But an abstract target is not good enough. As Finkelstein once remarked, Americans fought not National Socialism but Hitler in WW2; not Al-Qaeda but Osama bin Laden in the War on Terror. The narrative was given. One of the leading ideologues of Orban’s party, Maria Schmidt, director of the “House of Terror”, a museum dedicated to the victims of hardline communist terror in the early 1950s, readily provided it: a Hungary that was always the innocent victim, surrounded by enemies, yet protecting its identity and defending Christianity from adversaries ranging from the Ottoman Empire centuries ago to the investment bankers of the present day. All that was needed was a person who embodies this threat. According to Das Magazin, Finkelstein and Birnbaum used a telephone survey to determine if Soros was known sufficiently well among would-be voters to serve as the target of a negative campaign. He proved to be the perfect enemy. He qualifies as a liberal, and he represents something hated by conservatives: a successful investor who wants to weaken capitalism. On the other hand, as he is not a politician and doesn’t even live in Hungary, he has no means to fight back. The 2015 migration crisis was the icing on the cake. An essay Soros once wrote predicting a large number of refugees was relabeled the “Soros-plan”, demonstrating that Soros wanted to flood Hungary, and Europe in general, with Muslim “migrants”. By extension, any NGOs supported by Soros became targeted, as well as the Soros-founded Central European University, which was ultimately driven out of the country altogether, moving its main campus to Vienna. The Soros-project was so successful, it was exported to other “markets”: anti-Soros voices were heard from Columbia to Kenya, from Israel to Australia. Even Donald Trump once asserted that the “caravan” heading towards America’s borders is funded by Soros. The antisemitic overtone of the campaign is unmistakeable. Ironically, Finkelstein and Birnbaum are both Jewish. Birnbaum denied that the campaign had anything to do with antisemitism. He even claimed, rather improbably, that he did now know that Soros himself was Jewish. But Das Magazin reminds us that Finkelstein has not refrained in the past from supporting a candidate with known antisemitic views and that despite being gay, he also supported anti-gay politicians in the US. Theresa May’s Brexit fiasco What do you do when confronted with racism by those closest to you?